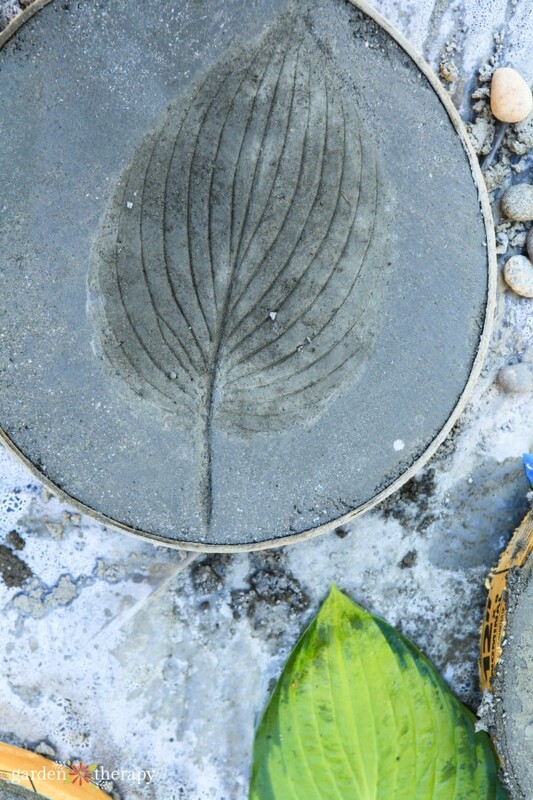 These stepping stones are a true reflection of your garden because they are imprinted with leaves from the surrounding plants! Leaf print stepping stones can be made in an afternoon and cost less than $2 each in materials, making them a thrifty yet beautiful garden DIY project. 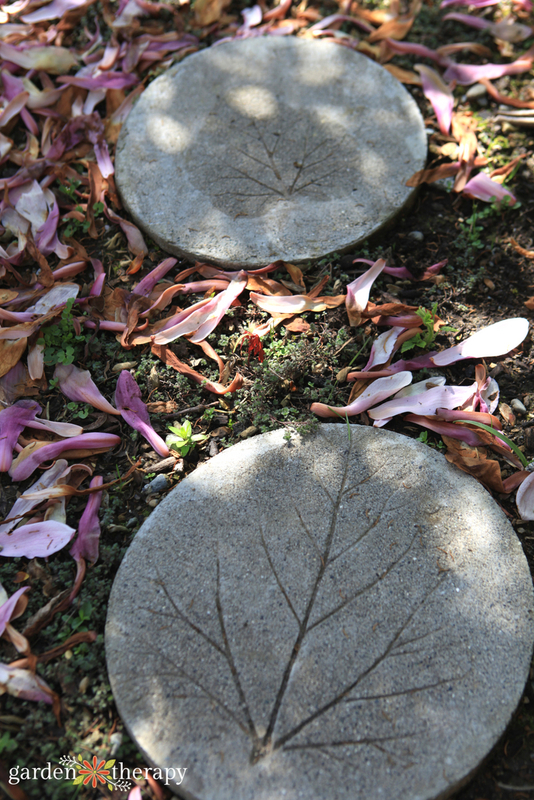 Natural elements from the garden combined with the rugged, man-made look of concrete come together to create striking stepping stones that look attractive trailing their way down the garden path. Plus, they are super easy to make. Grab a few materials and let’s get started! Note: please use safety gear when working with concrete and power tools. 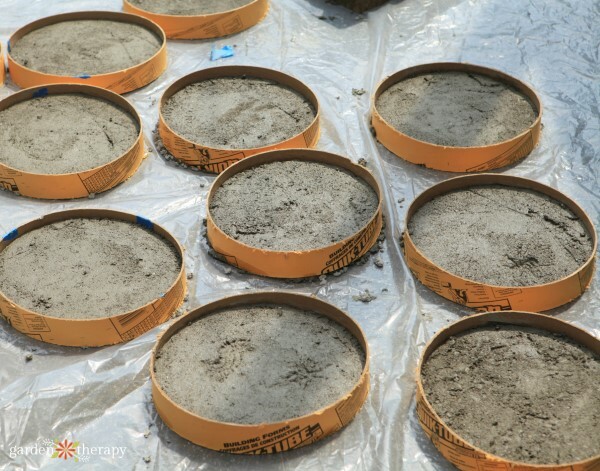 Cut the concrete form into 16 two-inch thick molds by using a hand saw or a handheld circular saw. Use a sheet of paper wrapped around the tube as a guide and carefully cut the first ring off the tube. Cut it open by using a box cutter to slice through the ring’s width. 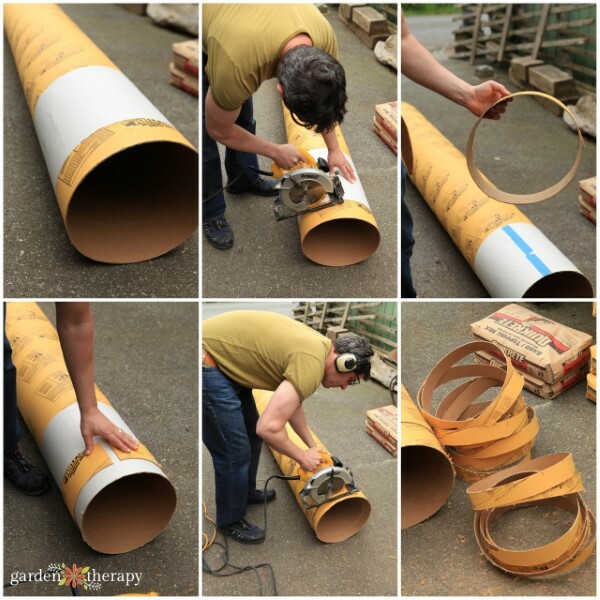 Place the cut ring on the tube to use as a guide for all the remaining cuts. Tape the ring together and place it a fraction more than two-inches from the end if you are using a hand saw, or place it where the guide runs if you are using a handheld circular saw. Cut 20 rings to use as stepping stone molds. Set the rings on a plastic drop cloth and mix the standard concrete according to the instructions on the package. 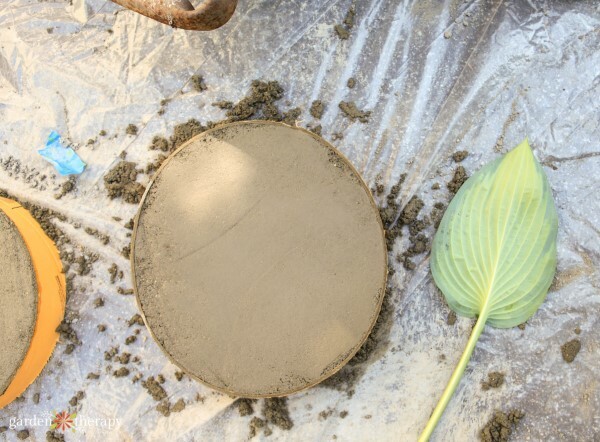 Fill each of the molds ¾-full of concrete and use the trowel to smooth it out. Take care to remove any air bubbles. This base layer gives the stepping stones strength. 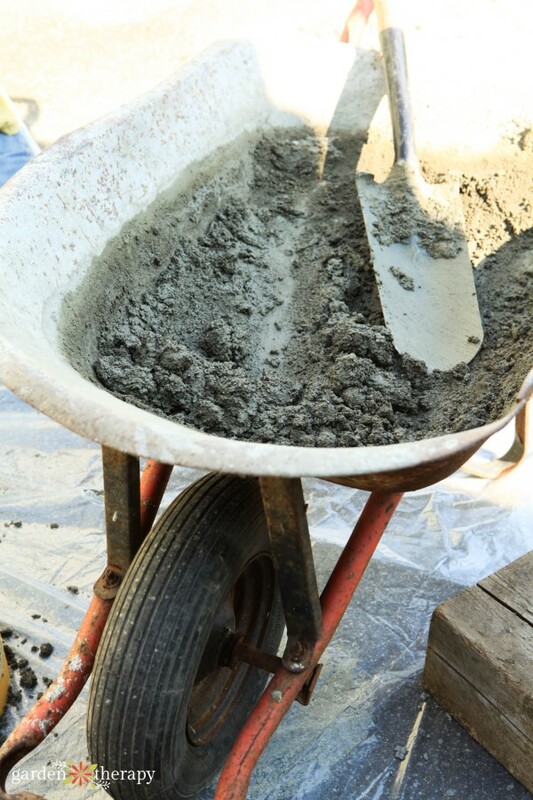 Mix the topping or repair concrete and add it to the top of each stepping stone. 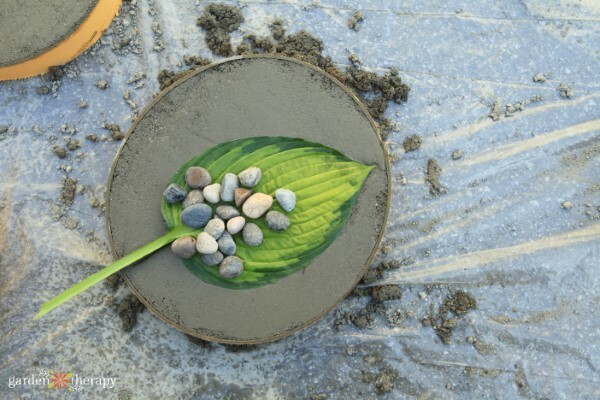 This layer gives the stepping stones a smooth, refined top, perfect for leaf prints. 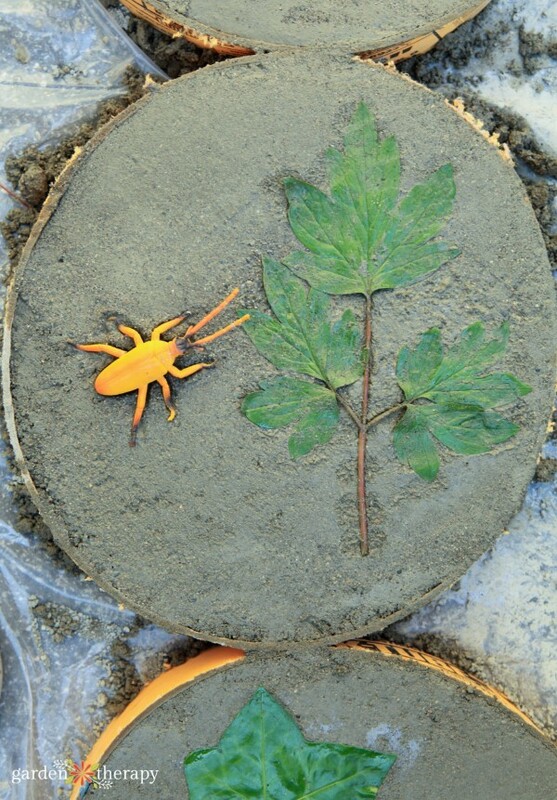 Working quickly before the concrete hardens, spray the back of the leaf with cooking oil and press firmly into the concrete. The best leaves are flat, strong, and have thick veins. 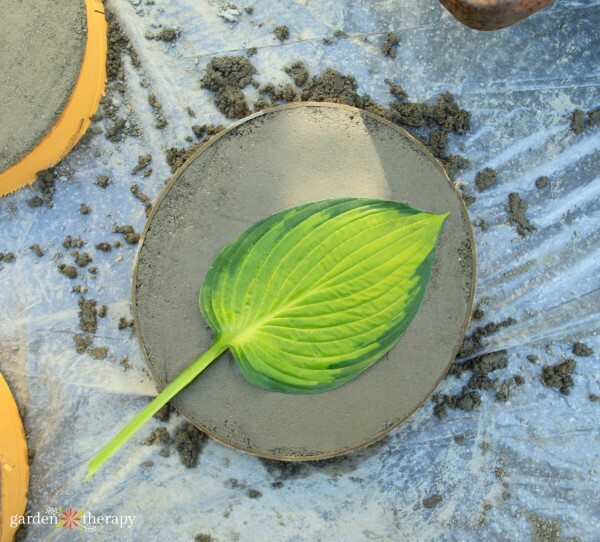 Always press the back of the leaf (with all the veins) into the concrete for the best impression. 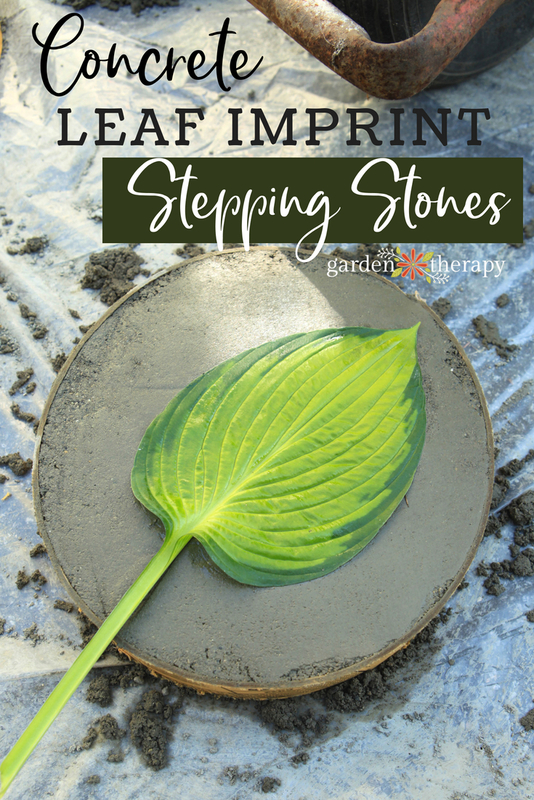 Feel free to experiment with the different leave in your garden, but in my experience I have found that hosta, rhubarb, and ivy leaves work really well for making leaf print stepping stones. You can also use any other objects that strike your fancy to print on the stepping stones. I made one with a bug print using a plastic toy insect. 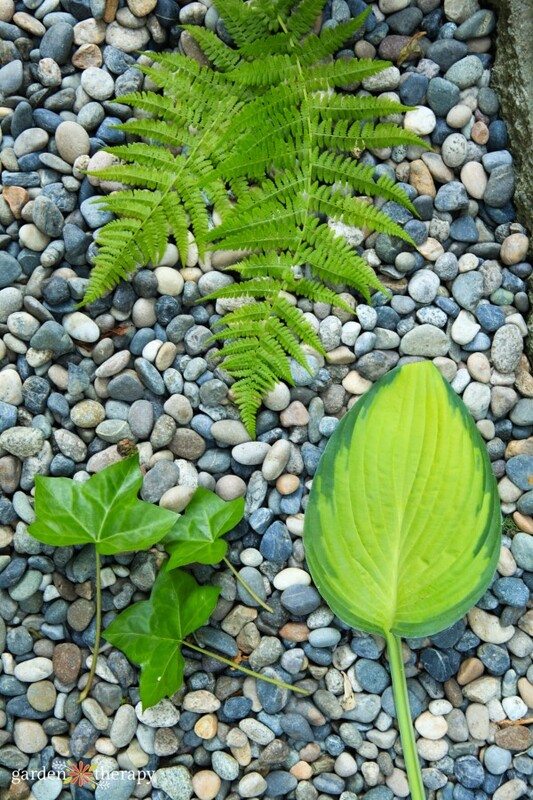 Use your fingers to press the leaf into the concrete as well as you can, then set a few pebbles on top to hold it in place. Cover with a plastic drop cloth and let dry for 24 hours. The next day, remove the leaf and cut off the mold. Set the leaf print stepping stones out in the garden surrounded by walkable creeping plants like woolly thyme. Come Visit a Play Garden! Wow this is awesome. I would love to try this.